Way back in the Winter Wonderland issue we featured the gorgeous Delightful Muddle vintage boutique, and the girls are back with their Summer collection. The boutique was originally a pre-war shop selling mostly Victorian lace and collectables, but over the years it has been passed down through the family and now offers good quality vintage pieces at affordable prices, all from the comfort of your living room. We spoke to Catherine to find out more. So what can we expect from the Summer collection? We'll be continuing with our current theme of bright florals with a new range of denim. We'll be adding far more jewellery to the site and improving on our accessories section. As usual our main focus is on dresses as these are always our best sellers, so expect lots of pale pinks and nudes. The swimwear that we were stocking last year will also be back in the next few weeks. 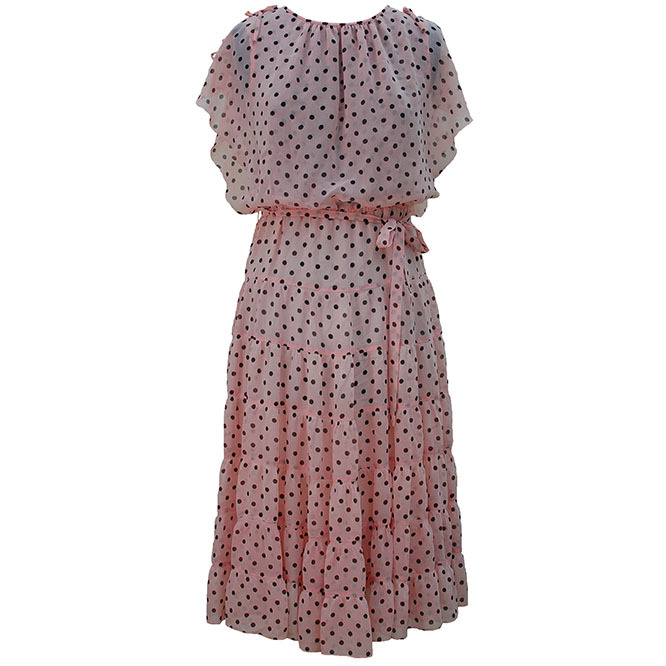 My favourite dress on the site is this tiered pink polka dot dress as it has such a wearable classic shape. We also love the cropped floral blouses with high waisted denim shorts that'll we'll be introducing around July which are gorgeous. What plans do you have in store for next few months? We recently celebrated our first birthday, and it was lovely to see how many loyal customers we already have. There is a lot we'd like to do with the site to improve it. We'll be adding more information sections, and we'd like to get our customers more involved by adding photos and illustrations. We recently started am occasional stall at Portobello market and took part in Frock me vintage fashion fair, which were great fun an a great oppertunity to spread the word about delightful muddle so we are planning to exhibit our stock a lot more this year. We are both very girlie and love flowers. I am very classic and love floral dresses and pumps and Becca loves denim shorts and pretty vintage tops so you see a lot of both of us in our collections. Delightful Muddle is all about being feminine and taking inspiration from the past. But at the same time looking at what is on the high street and the catwalk and using the styles and colours that we see to choose our stock. This Summer is all about pale pinks, nudes, and florals whether your a dress girl or you like a more more funky look. And lastly, what's your favourite thing about Summer? We love the summer because we can sit in the garden and drink pimms and because its lovely to get all our favourite summer dresses and shoes out. Not to mention trips the lovely british seaside. And for the next month the girls are offering a 25% discount for Cellardoor readers, just enter the code delightfulcellar at the checkout!